With the exception of die-hard aficionados of European or Italian horror cinema, most people may not have heard of giallo cinema or have seen many films in this subgenre of horror. Most academic film studies tend to ignore horror cinema in general and the giallo specifically. Critics often deride these films, which reveal more about the reviewers' own prejudices than any problem with the works the… mselves. As a counter to such biases, Mikel J. Koven argues for an alternative approach to studying these films, by approaching them as vernacular cinema-distinct from "e;popular cinema. "e; According to Koven, to look at a film from a vernacular perspective removes the assumptions about what constitutes a "e;good"e; film and how a particular film is in some way "e;artistic. "e;In La Dolce Morte: Vernacular Cinema and the Italian Giallo Film, Koven explores the history and evolution of this aspect of cinema, and places these films within the context of Italian popular filmmaking. 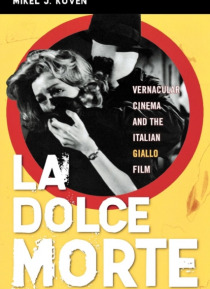 He addresses various themes, motifs, and tropes in these films: their use of space, the murders, the role of the detective, the identity of the killer, issues of belief, excess, and the set-piece.In addition to being the first academic study of the giallo film in English, this book surveys more than fifty films of this subgenre. In addition to filmmakers like Mario Bava and Dario Argento, Koven also looks at the films of Lucio Fulci, Sergio Martino, Pupi Avati, Umberto Lenzi, and others. In all, the works of twenty-five different filmmakers are considered in this book. Also explored are the inter-relationships between these films: how one influences others, how certain filmmakers take ideas and build off of them, and how those ideas are further transformed by other filmmakers. Koven also explores the impact of the giallo on the later North American slasher genre.